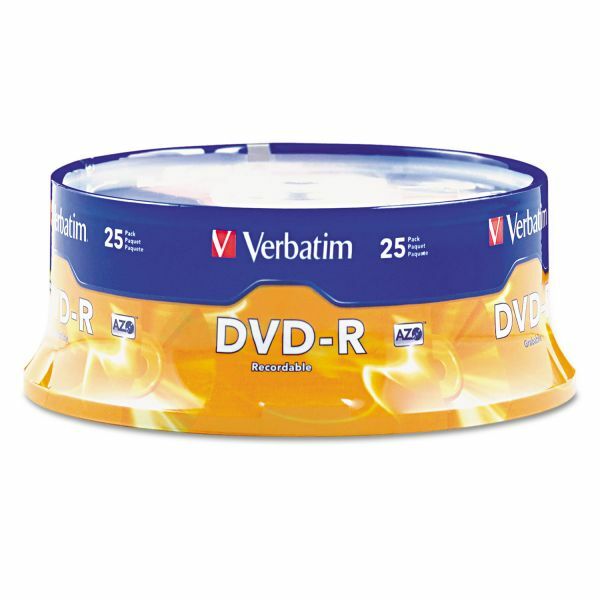 Verbatim DVD-R Discs, 4.7GB, 16x, Spindle, Matte Silver, 25/Pack - DVD-Recordable discs offer 4.7GB or 120 minutes of DVD-quality storage capacity that is ideal for recording home movies and video clips. Write speed is up to 16X. AZO Technology delivers superior performance and reliability. Using one-time record discs ensures that your movies, video clips or other data will not be erased. Most DVD writers and readers use these discs interchangeably, with no noticeable performance differences. With older units, check your manufacturer's suggested DVD format to ensure compatibility.